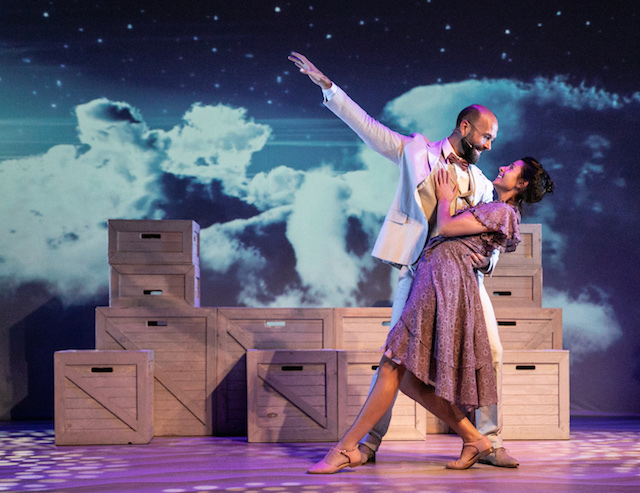 A recent Tweet clanged around my head throughout the world premiere of this new ‘romantic comedy musical’: accept the choices of theatre-makers … don’t be mourning the show you wanted them to make. Yes, It Happened In Key West wasn’t the show I’d have made from its ghoulish source material, or hoped to see. And yes, it really did tug at my taste buds. But I couldn’t deny its chutzpah. Its difference. And its attempt to find love in the strangest of places. It Happened In Key West is based on the real-life actions of Count Carl Von Cosel, a German X-ray technician who, in 1930s Florida, exhumed the corpse of his wife Elena so that they might stay together in life, despite her early death from tuberculosis. The promo suggests this is ‘Richard Curtis crossed with Tim Burton’. And yes, there’s a definite attempt to find humour in awkward relationships, with just a ladle or five of romance. There’s also a definite darkness in the tale of a fraudulent doctor keeping the corpse of his beloved on the brink of some imagined resurrection. But where Curtis and Burton are masters of their worlds, the world-makers of this show seem, currently, less confident with their mix. Act 1 builds the world with some lovely melodies and amusing character work. It takes us from Cosel’s love-at-first-sight (dubious), to the diagnosis and death of Elena, to that all-important exhumation. A family is comically sketched. A background of poverty is established. A blood-draining doctor from East Europe is introduced (again, dubious). A home-made plane (!) is also introduced. Nothing too wrong with any of this. Strange and peculiar, but such is the stuff of real-life. All this, however, meant it took an awful long time to reach the show’s trigger moment. And while there was some drama in the fight to save Elena, we all know where this is going. The meat of this story is the mind of a man who could do such a thing. Get to the drama we couldn’t guess! Give us good reason why you’ve musicalised this morbid tale! Fortunately, Act 2 was a shorter and livelier affair. The opening group number began with a few queasy mentions of Elena’s decomposing corpse before filling the stage with some much-needed life. Still though, the tone and tale faltered. By the time we reach the ‘love never dies’ conclusion, the brief explosion of strange has resolved into something much more familiar and romantic. Inner thoughts as belting numbers, making general observations about love. Not for me. Wade McCollum as Count Carl Von Cosel has a gorgeous Broadway baritone and carries much of the evening’s comedy, even though many of the jokes didn’t spank my funny bone. As Elena, Alyssa Martyn is equally gifted but has little opportunity to express, such is her diminished role as Cosel’s object of affection (even when alive). All in all, I loved the story. Its execution? No. The plotting, the emotional journeys, the lack of memorable moments, the over-reliance on a back-projected backdrop and amplified sound … just not to my taste. Like Elena’s corpse that’s paraded through Act 2, this musical comedy currently has the whiff of a great idea gone bad. It’s a unique show, no doubt. But not a show to fall in love with. Cast: Wade McCollum, Alyssa Martyn, Val Adams, Miguel Angel, Alexander Barria, Mary-Jean Caldwell, Andrea Golinucci, Siwan Henderson, Sophia Lewis, Guido Garcia Lueches, Hannah McIver, Ross McLaren, Johan Munir, Nuno Queimado.